Wednesday! Here we are once again! Massive action is on the horizon. The book this week look filled with punching and blasting (I hope). But before I get too ahead of myself, I wanted to touch on a few of the books from last week. DC Comics has my brain twisting and turning. Two of my favorite comic book heroes (and the rest of the world’s) are getting yet another ‘re-vamp’ treatment. I’m talking about Superman and Batman, and I feel so indifferent about each of the directions the characters are heading that I’m dreaming about waking up to a world without Superman or Batman. But wait, this is reality. I’m pretty irritated with the complaints about Jim Gordon as the new Bats. It’s a change I’m welcome to. My only problem is Bruce Wayne and the Dyonesium. In Batman #43, the readers find out how Bruce Wayne survived the collapse of the Batcave. This also means Joker survived as well, if you think about it. Apparently, Bruce turned off the ‘Bat-mode’ in his brain. He doesn’t care that he lost everything. Instead of punching bad guys in the face, he’s working in the community. Jim comes to Bruce, asking for any help using Bruce’s connections to Batman. Bruce declines. He doesn’t want to help Jim, just the children’s rec center. If there is one thing Snyder has done once again in Batman is develop a new, compelling villain. At the end of the day, I feel Mr. Bloom is designed to be a foe meant for Jim Gordon, as opposed to Batman. Bloom’s gimmick is weaponizing super powers and selling them to individual buyers. Not one specific power dealt to the public, but one specific power dealt to one specific individual. He’s really cool. Ask The Penguin. Oh man, then there’s Superman and Action Comics. I love Greg Pak’s Marvel catalog. His Hulk stories are top-notch. Amadeus Cho is one of the better characters created for mainstream comics in the past fifteen years. That said, if not for Aaron Kuder’s incredible art, I’m not sure if I would be reading Action on a monthly basis. In the latest issue, Clark lets his community know that he no longer can be Superman. “You are all Superman now.” I’m sorry, but Superman would never admit defeat. All is not lost for him. Action’s tone is just off for me. Pak’s run went from horror to not really horror to now shadow creatures… I don’t know. I’m not sure what’s going on at DC. Speaking of DC, Vertigo’s Mad Max Fury Road series of stories are solid primers for the film. I highly suggest picking up the trade. It’s available for pre-order now. If you thought the film was hands-down the best film of the year (like me), check this collection out. Although I managed to get through all of the books from the previous two weeks, Action Comics and Batman were the only new titles from last week I got through. (I’ve been super-busy.) I still need to get to my Secret Wars stuff from last week. Later on tonight I will dive into all that and hopefully more. Why? Because there is a ton of Secret Wars material coming out today! And Star Wars too! And Invincible! And Justice League! Sheesh. I can’t wait to get into the new Justice League. As opposed to what’s going on in your Superman, Batman, and Wonder Woman comics, The Darkseid War, for me, is the most entertaining storyline in all of DC. Obviously, the events of TDW predate the convoluted ‘DCYou.’ (Right?) I previously elaborated on Batman’s ‘moment’ from JL #42 a few weeks back. I want to see how The New Gods react to ‘Bat-Metron.’ I’m sure it won’t last. How could it? Thragg is amassing an army. Invincible has no clue. But is that the real story? Image Comics dropped some teasers about where Invincible is heading. Will Thragg attack before Invincible goes back in time? Is this why Invincible is going back in time? Wait, why is Thragg building this army of alien offspring? I love this comic more than most. Jason Aaron continues to weave the Star Wars story a lot people wanted years ago. I’m excited that Stuart Immonen takes over the pencils for the next arc. 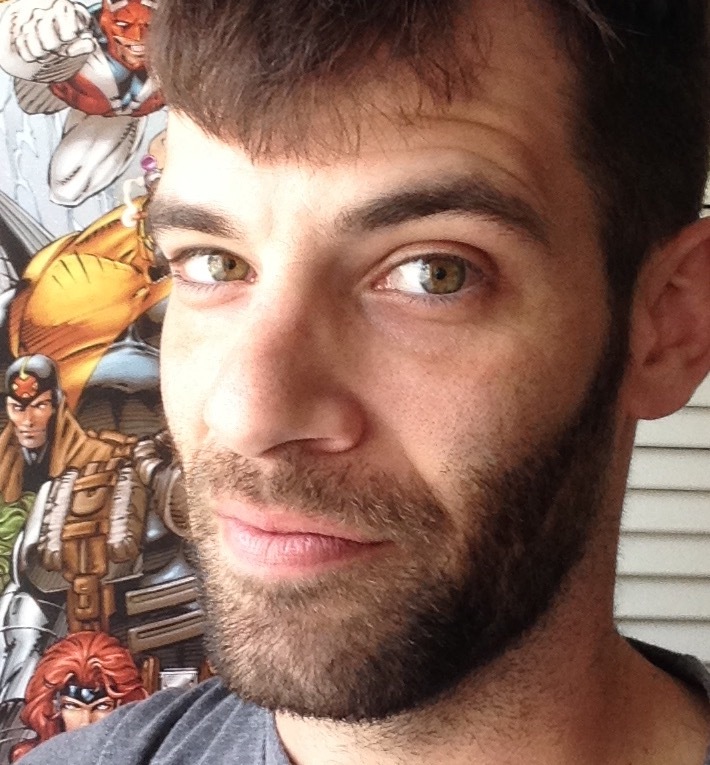 His work on All-New X-Men was tremendous. I feel Immonen’s style will fit right into this series and universe. Apparently Luke Skywalker and R2-D2 travel to Coruscant. I find this interesting. What has become of the city-planet since The Galactic Empire took over? I never understood why the Jedi Temple is on Coruscant. Who knows, maybe Aaron will give us a reason. Why not? He’s managed to knock everything else out of the ballpark. And yes, there is the Secret Wars tie-ins. I’m especially looking forward to reading Amazing Spider-Man: Renew Your Vows, Weirdworld, and Guardians of Knowhere. All three I’ve raved about. A friend of mine read Renew Your Vows #4 and led me to believe it is still moving along nicely. Annie May Parker is a character that should have already been established in the 90’s. That’s just my opinion. Who ever thought Arkon would be one of the most interesting characters in 2015? Weirdworld is a strange brew of fantasy, magic, and sci-fi, which Jason Aaron (surprise, surprise) excels in creating. Somehow Aaron’s managed to integrate the 80’s toy property/comic Crystar The Crystal Warrior into the mix. Mike Del Mundo’s art is stunning. This title, along with Where Monsters Dwell, should not disappear after the Secret Wars event concludes. So, yeah. It’s comic book Wednesday. Go out and grab some books. Read. Enjoy. We’re approaching SUMMERSLAM weekend. 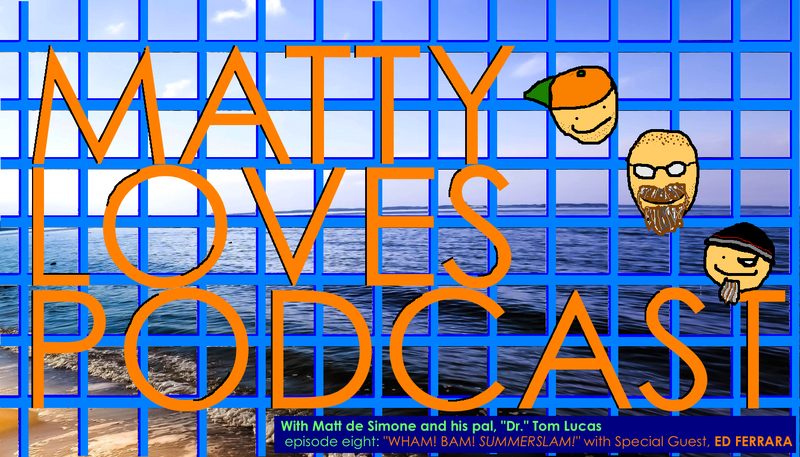 With that in mind, check out the newest episode of MattyLovesPodcast on Friday. “Dr.” Tom Lucas and I are joined by Ed Ferrara as we talk about pro-wrestling: long-formatted storylines, wild personalities, patriotism, and–of course–we run down the card for “the biggest event in the history of the WWE.” We could’ve talked for hours and hours. It was such a good time. I miss talking about pro-wrestling history. There’s more to come. I hope everyone has a wonderful Wednesday. Come back next week! Same day! Same blog! Matt de Simone is a huge fan of pre-Internet pro-wrestling. He’s a fan of a lot of entertainment properties pre-Internet. Did the Internet destroy entertainment? Did it make the industry better? Why are there so many advertisements in comic books? Write an essay (5,000 words minimum) on how the dinosaurs became extinct.